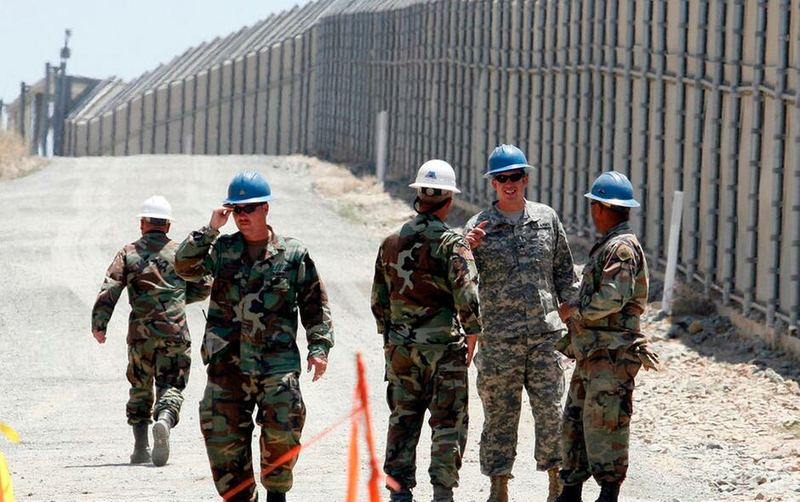 Members of the California National Guard work next to the U.S.-Mexico border fence near the San Ysidro Port of Entry in San Diego. California Gov. Jerry Brown agreed Wednesday, April 11, 2018, to deploy 400 National Guard troops at President Donald Trump's request, but not all will head to the U.S.-Mexico border as Trump wants and none will enforce federal immigration enforcement. SACRAMENTO, CALIF. (AP) — California Gov. Jerry Brown accepted President Donald Trump's call to send the National Guard to the Mexican border, but rejected the White House's portrait of a burgeoning border crisis and insisted that his troops will have nothing to do with immigration enforcement. The Democratic governor broke a week of silence Wednesday by agreeing to contribute 400 troops, though not all will be on the border. Brown's commitment brought pledges from the four states that border Mexico just shy of the low end of the president's target to marshal 2,000 to 4,000 troops. Brown cast his decision as a welcome infusion of federal support to fight transnational criminal gangs and drug and firearms smugglers. "Combating these criminal threats are priorities for all Americans - Republicans and Democrats," Brown wrote in a letter to Defense Secretary James Mattis and Homeland Security Secretary Kirstjen Nielsen. Federal law, notably the Posse Comitatus Act of 1878, sharply limits military involvement in civilian law enforcement, creating a supporting role for the Guard. The Pentagon said last week that troops won't perform law enforcement functions or interact with people detained by border authorities without its approval. Brown released a proposed agreement with the federal government that emphasizes the widely shared understanding of the Guard's limited role but explicitly bans any support of immigration enforcement. It says troops cannot guard anyone in custody for immigration violations or participate in construction of border barriers. The White House praised Brown's decision without addressing his comments on immigration enforcement. "We're also glad to see California Gov. Jerry Brown work with the administration and send members of the National Guard to help secure the southern border," White House Press Secretary Sarah Huckabee Sanders said. Reaction in California was limited, with few of Brown's allies or opponents weighing in. State Sen. Kevin de Leon, a Democratic U.S. Senate candidate and author of California's so-called sanctuary state law, said Guard deployment was unnecessary and not a good use of resources. But he said more can be done to combat border crime and that he appreciated Brown's design of "a clear and limited mission focused on real public safety threats." "I am confident Governor Brown will not use our National Guard to harass or tear apart immigrant families in California," he said in a statement. Rob Stutzman, who advised former Republican Gov. Arnold Schwarzenegger, praised the decision on Twitter, calling Brown's decision to accept money for using the Guard to fight drugs and human trafficking "good government." Immigration advocacy groups were generally quiet, although some were skeptical. Pedro Rios, director for the American Friends Service Committee's U.S.-Mexico border program in San Diego, questioned why Brown would send troops while rejecting Trump's premise that they are needed to help stop illegal immigration. "If he's in disagreement with Donald Trump about the justifications for having the National Guard on the border, then why would he accept it?" he said. Unlike Republican governors in other border states, Brown disagreed with Trump's portrayal of a border spiraling out of control, noting that Border Patrol arrests fell to the lowest level last year since 1971 and that California accounted for only 15 percent of the agency's arrests on the Mexican border. "Here are the facts: there is no massive wave of migrants pouring into California," Brown wrote the Trump Cabinet members. In contrast, Texas Republican Gov. Greg Abbott, who is contributing 1,000 troops, embraced Trump's mission the day it was announced, saying it would promote the rule of law and "help ensure we are doing everything we can to stem the flow of illegal immigration." Brown said California's troops would join an existing program to combat transnational drug crime, firearms smuggling and human trafficking. About 250 California National Guard troops are already participating, including 55 at the border. The new contingent of California Guard members being deployed could be posted at the border, the coast and elsewhere statewide, Brown said. 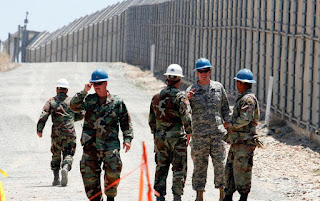 California deployed troops to the border under former Presidents George W. Bush in 2006 and Barack Obama in 2010. Associated Press writer Elliot Spagat in San Diego contributed to this report.